So you have just been invited to interview at the MBA school of your dreams. Obviously this raises your chance of getting in, but by how much? 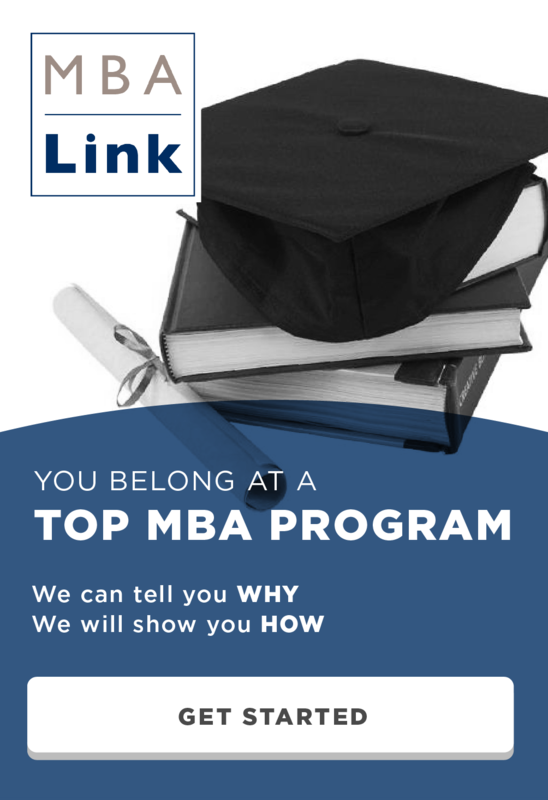 In general, top ten schools have lower MBA interview acceptance rates while schools ranked 11 to 20 have a higher acceptance rate for applicants who were interviewed. The acceptance rate ranges from 34% to 75% for schools in the top 20. 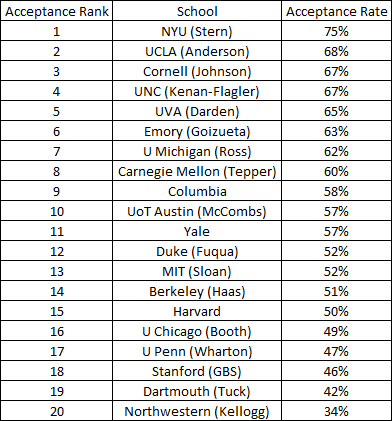 The average MBA interview acceptance rate for the top 10 is 50% and it is 62% for schools ranked 11 to 20. NYU jumps out as the highest acceptance rate by a wide margin. If you have been selected to interview at Stern then you can prepare to open a bottle of champagne because you are probably going to business school. No other school in the top 10 has an interview acceptance rate above 60%. 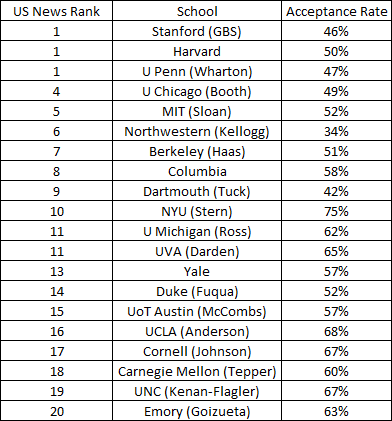 On the other end of the spectrum is Kellogg and Tuck with the lowest acceptance rates. These two schools will allow anyone who visits campus to interview, so it is not surprising that they admit significantly fewer applicants who are interviewed. Most of the top 10 schools have an acceptance rate clustered between 46% and 51%. Good luck and don’t forget to prepare for your MBA interviews! This entry was posted in Admissions, Anderson, Booth, Columbia, Darden, Emory, Fuqua, Harvard, Interview, Johnson, Kellogg, Kenan-Flagler, MBA, McCombs, Ross, Sloan, Stanford, Stern, Tepper, Tuck, Wharton, Yale and tagged Admissions, Columbia, Cornell, Duke, Harvard, Interview, Kellogg, MBA, Ross, Sloan, Stanford, Stern, Tuck, Wharton on February 9, 2015 by Data Guru. This is an awesome post! Where did you get this data from? I haven’t been able to find these numbers anywhere else. Denis, everything you mentioned is a great point. I do compare the data that I collected to the published admissions stats elsewhere to make sure there are as few biases as possible. What I have found is that people will almost always report acceptances and interviews while rarely report a reject. So I treat a no response as a rejection. This is all based on historical data from the last 3 years, so if schools have recently changed their interview policy it will not be reflected in the data. Question: Kellogg extends interview to all applicant and its acceptance rate is around 23%. How come the interview acceptance rate here is 34%? is it simply because of the sample you took from gmatclub or is there something i’m missing here? Kellogg sometimes does give interview waivers, so not all applicants end up interviewing. In general the numbers for Tuck and Kellogg are pretty meaningless since everyone can interview. Some GMAT Club applicants might not even bother indicating that they interviewed with those schools since it doesn’t mean anything. Having interviewed at UCLA Anderson in Round 2, this table helps me breathe a little easier! Great work compiling all this data, I’m sure it’s going to become an invaluable resource for applicants now and in the future.